Gemstones have a special place in the human life. Their astrological benefits can change the lives of the wearers for the better. However, it is important to note that not all gemstones are compatible with each other. This means that if your horoscope or birth chart calls for a Pukhraj Stone, then it may or may not be compatible with the gemstones that you are already wearing or are planning to wear. This is the reason why it becomes essential to take note of all those astrological stones that are incompatible with the one that you have been suggested to wear. Doing this will prevent you from facing the negative effects of a contradictory gem combination. According to Vedic Astrology, each gemstone is ruled by a planet from the nine planets in the Universe. These nine planets include Sun (Surya), Moon (Chandra), Mars (Mangal), Mercury (Budh), Jupiter (Guru), Venus (Shukra), Saturn (Shani), Rahu as well as Ketu. As these planets differ from each other, so does their effects on humans. Also, their relationships with each other are also unique and have varied effects. While some planets are friends and highly compatible, some are neutral, and some are nothing but enemies. To avoid wearing gemstones of combinations that belong to enemy planets, it is advised to always take care of the gemstones combination and know if the corresponding planets are compatible or not. Wearing gemstones that belong to enemy planets may not yield any substantial results. But, wearing gemstones that belong to friendly planets may bring huge benefits to the wearer. 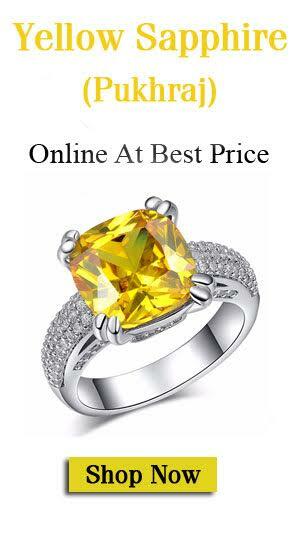 If you have been advised to wear a yellow sapphire gemstone, and wish to know about the gemstones that may contradict with its astrological benefits, then keep reading to get the much-needed information and save yourself from experiencing problems in the future. Yellow Sapphire is associated with the planet Jupiter, and Blue Sapphire is associated with the planet Saturn (Shani). As Jupiter and Saturn share a neutral relationship and not a friendly one, usually it is not recommended to wear the two stones together. If in case a person has been advised to wear both of these sapphires together, then going for a Pitambari stone may help. The Pitambari stone is a partially yellow colored sapphire and partially blue colored sapphire. Even though the combination of yellow sapphire and blue sapphire is not generally recommended, in rare cases, wearing Pitambari may be advised by an astrologer if the wearer’s horoscope necessitates it. You May Also Read: Can Yellow Sapphire And Blue Sapphire Stone Be Worn Together? Yellow Sapphire is governed by Jupiter, which has a hostile relationship with the planet Mercury (Budh). The Emerald stone is ruled by the planet Mercury, and this is the reason why this gemstone is incompatible with a yellow sapphire. So wearing yellow sapphire and emerald together is not advisable. Just like Mercury, Jupiter also has an inimical relationship with the planet Venus (Shukra). This planet governs the gemstone Diamond, which makes diamond contradictory with a yellow sapphire. The Opal stone is another gemstone which corresponds to the planet Venus. As already mentioned, Venus is not compatible with Jupiter. And that’s why wearing opal is not recommended with a yellow sapphire. White Sapphire may belong to the Sapphire family, but it is also associated with the planet Venus (Shukra). Hence, Yellow Sapphire should not be worn with White Sapphire due to the unfriendly nature of these gemstones’ planets. Gomed is filled with the energies of the Rahu planet. Rahu and Jupiter are not compatible planets. Thus, wearing Gomed is not suggested with a Yellow Sapphire gemstone. As per Vedic Astrology, Cat’s Eye is the gemstone of the planet Ketu. Ketu and Jupiter don’t share a cordial relationship, and that’s the reason why one should not wear Cat’s Eye with Yellow Sapphire. 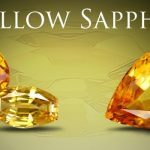 How Yellow Sapphire Gemstone Can Do Magic For Virgo Zodiac Sign? Can Yellow Sapphire And Emerald Stone Be Worn Together?